Put your camera on some kind of tripod alternative support: a bean bag, mini-pod, or other device. Brace the camera body with your hand against whatever solid support is available. The first choice is always the best. Nothing beats a sturdy tripod for stability. But you won’t always have one available and sometimes a tripod is impractical or not allowed. A small tripod alternative is a good second choice depending on its design and intended use. More about that later. This method will do in a pinch but the fact is your camera does not connect solidly to objects. It is designed to be hand held or mounted on a tripod, not jammed against a pillar with your hand. That brings us to small, portable tripod alternative devices for camera stabilization. These come in two basic categories: those that sit on a reasonably flat level surface like mini-pods or bean bags, and those that attach to objects with a mechanism like clamps, suction cups, flexible legs and so on. These are all hands-free devices that are not designed or intended to be held by hand against available supports. So in the absence of a tripod you are left with two choices: an alternative device for hands-free, stand alone support, or use your hand to jam the camera body against a post or other object. Now there’s a third choice, one that bridges the gap between hands-free, stand alone devices and the time honored technique of pressing the camera body against supports with your hand. 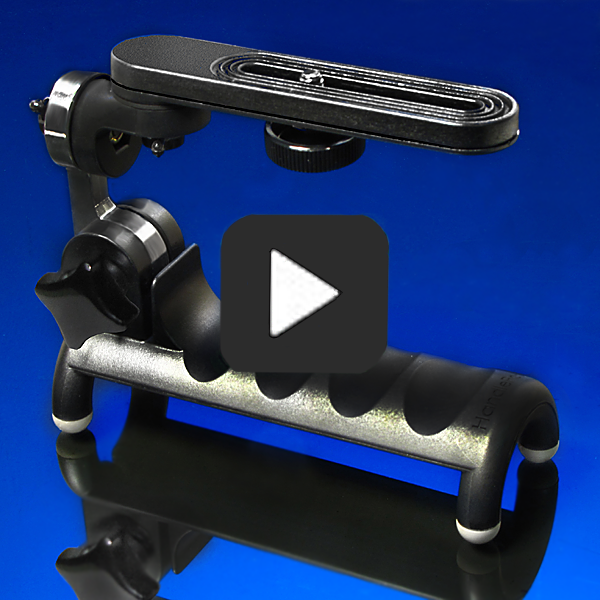 HandlePod blends the two methods with a solid connection to any support object you choose plus the option to hold it in place with just your hand for tripod-like stability. It does not attach to supports (unless you choose to attach it with the supplied elastic cord). It just uses your hand to keep it in place so any solid object regardless of size or shape can be your camera support. HandlePod puts camera stability at your fingertips. This entry was posted in Tripod Alternative on November 21, 2014 by main user.